contributes to the diabetes online community to know that their voice is being heard. You can read more about it on A Consequence of Hypoglycemia. After my celiac diagnosis in 1998, I put diabetes management on the back burner for a while. The learning curve is steep when you first have to cut out all traces of gluten from your diet so for a few months I ate whatever – as long as it was gluten free – and didn’t worry quite as much about matching the insulin dose to what I was eating. I found I could only master so many skills at one time! Thankfully I did learn how to eat well while cutting out the gluten completely and after 8 difficult months, including a 30 pound weight gain and a 5% HbA1c increase, I felt comfortable enough with managing both diseases that things came back into order relatively quickly. I lost the extra weight over the next year and within 6 months, I had my A1c back under 7%. Once things were back on an even keel, I realised that these two diseases are, in fact, manageable together. (Not always easily, not without frustration, but definitely made easier with the support of online communities!) I came to realise that the celiac dictated what I ate (or rather what I didn’t eat) where as the diabetes had more of an influence on the quantity of food/carbs and the timing of my meals. And once I was on an insulin pump even the quantity and timing weren’t as limiting as they once were. The main challenge that remained was counting the carbs (especially in the relatively high carb gluten free alternatives to some normally gluten-full food choices) and then of course matching my insulin doses to my carb intake. I was diagnosed with diabetes and CD 18 and 16.5 years ago, respectively and much has changed in the world of gluten free food choices since then. I still cook most of my own meals from ingredients that are naturally gluten free, but I definitely eat store bought gf bread & pasta, some home-made cookies & cakes and the odd real treat from a gluten free bakery. The offer of good gluten free food choices is still greater in english speaking countries although it has also been improving by leaps and bounds here in France. In the last 3 years, no fewer than four gluten free bakeries/Cafés/restaurants have opened in my neighbourhood. Not just “somewhere” in Paris but within easy walking distance of home. Helmut Newcake, Thank You, my Deer, Bears and Raccons and Chambelland each have a slightly different and therefore very complementary offer in gluten free wares. And because sometimes I do venture beyond my own neighbourhood, the gf options across the city are also increasing: Helmut Newcake’s second location, Noglu, Biosphère. I have tested most and they all get my full marks of approval. They each are the kind of place that anyone could buy real french pastries & bread or eat a meal and not realise that what they are eating contains absolutely no trace of gluten. These are places you can go with a group and those who don’t have to eat gluten free will neither complain about the taste and texture, nor about the price when compared to a “regular” french bakery in Paris. All of these delectable cafés make for great temptation for high-carb treats. I don’t indulge often, but it’s hard to go in to buy a loaf of bread and not come out with something extra delicious – just because I can. I guess I’d better keep up this running routine to burn off enough calories and justify my sweet cravings! 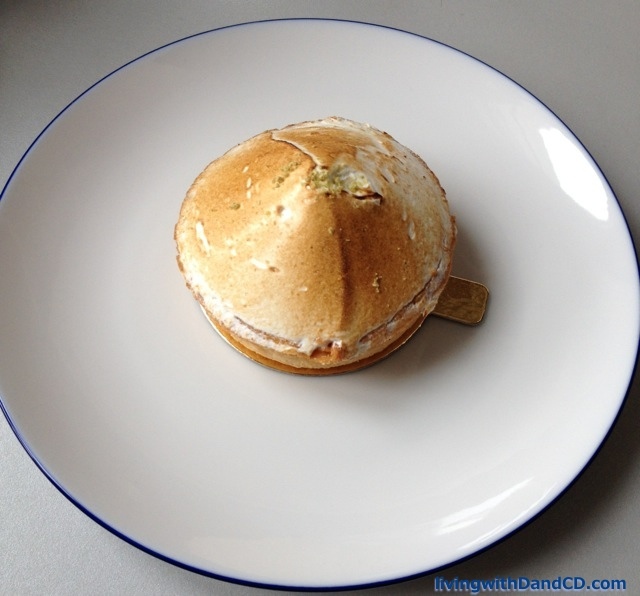 Now if you’ll excuse me, I need to go indulge in a tartelette au citron meringuée. I’ll leave you with something to drool over. Can anyone guess the carbs in this baby? This entry was posted in D & CD and tagged celiac, diabetes on March 10, 2015 by Andrea. Great post, Andrea. Bookmarking this – I need a return trip to Paris to try those bakeries. Thanks, Renza. I’ll give you the full tour when you come back! Interesting – liked your blog! I’m currently in the planning stages of a European trip, which is most likely to include Paris. I’ve been quite sad about the fact that I wasn’t going to be able to enjoy any French baked goods while there. This post has just proved that I’m oh so wrong! I’ve had celiac for around 16 years as well and it’s rare for me to find someone else that remembers the struggles in the beginning! Alex, I’m so glad this post can be put to practical use! Thanks for reading. Managing both is indeed VERY challenging. Most people -even those with D, don’t even have a clue just how different we have to look at food in terms of the pronounced effect of glycemic index on BG or just the often times insurmountable inconvenience it is to get fueled up. Good post. Awesome post, awesome and tasty info!! Sounds like you’re doing a good job keeping your mojo with both diabetes and celiac. I did a three-week gluten free trial last summer and couldn’t believe the ingredients in things like GF bread. Definitely not low carb! Hard to guess the size without a sense of scale, but I’d guess 48g? This makes me want to return to Paris! I guess 50g. carbs. I’m probably nowhere near close, but I’m sure every gram is totally worth it. Can’t imagine having to follow both… we have started weaving GF and low-carb into our word, more because my wife needs to go GF and it wouldn’t hurt me to try that too. And trying to just be healthier, less carby. But that’s a choice for me, and it’s not fair to be so limited without another choice. I am glad to know things have been changing and more options are out there. Sending you good continued vibes! You can try Sitron now. I tried it many times and it’s very good. 15 rue Marie Stuart 75002 Paris. Thanks for the recommendation ! My pleasure. You can try the site Because Gus they give interesting informations about shops and restaurant. In Sitron in January I found a “galette des rois” very good.